Before BlackBerry OS 7, advanced Gmail features were only available in individual messages inboxes (not the combined Messages inbox) using the Enhanced Gmail plugin. The plugin added features such as Report Spam, Add Star, Apply Label and Archive. With BlackBerry 7 these features are brought to the combined messages inbox as well. 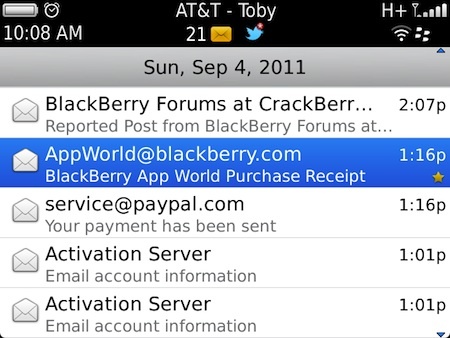 This is a welcome addition to many BlackBerry users (myself included) that stick to using the combined messages inbox. Keep reading for a quick breakdown of all the advanced Gmail features available for messages. These features can all be accessed from the BlackBerry menu within the messages app on BlackBerry 7. Just highlight a message, press the Menu key then choose what you'd like to do. 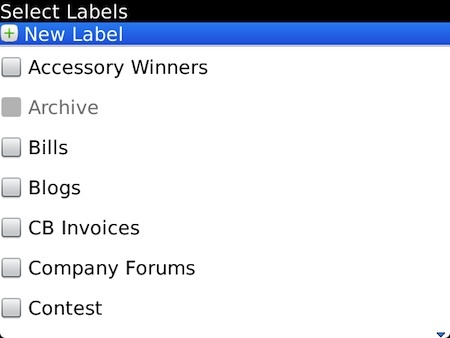 Apply Labels lets you organize your messages with your Gmail labels. The label list will show labels that you have already created in Gmail and you can even add or delete labels right from your device. This feature will help you sort your mail from your BlackBerry so things will be organized in your Gmail account, saving you the time of sorting though your messages when viewing from your PC. No hidden meaning here. The Add Star option lets you star a message from your device. 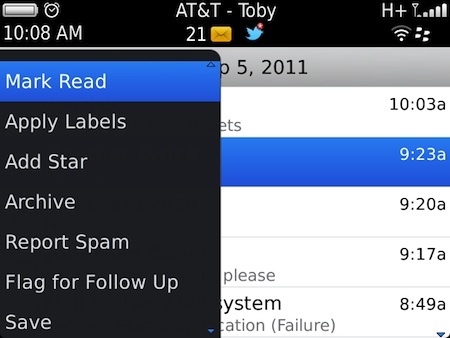 The message will show a small yellow star in your BlackBerry inbox as well as in Gmail. Use the Add Star option for those important messages you need to keep track of on the go, much like the Flag for Followup in the native BlackBerry OS. 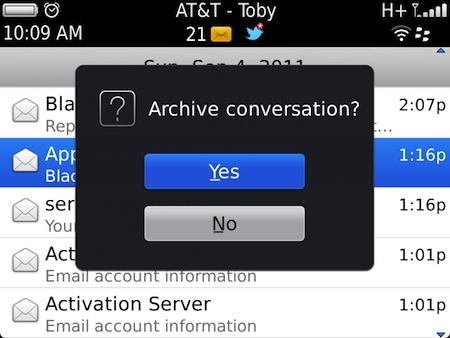 Archive lets you use Gmail's Archive option right from your BlackBerry. This will send the chosen message(s) out of your inbox and archive them through your Gmail account. If you're like me and try to keep your inbox clean all the time, archiving messages is the best way to do that -- and archiving from your device ensures things will be clean the next time you hit your inbox from a PC. Another self-explanatory option here, Report Spam lets you flag a message as spam from your BlackBerry. 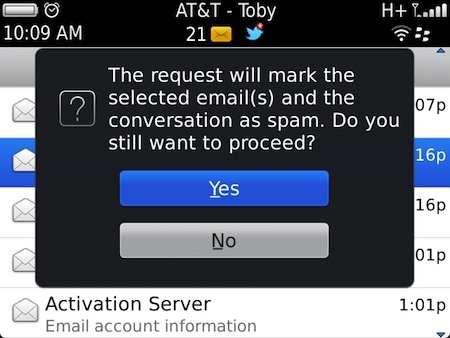 Use this feature for those unwanted spam messages that hit your device. The mail will be removed from your Gmail inbox and sent to your spam folder. Using the advanced Gmail features can help to keep you organized and better manage your inbox. At times it's hard to keep things straight when going back and forth between your mobile device and a PC, but using these tools can can truly help you manage your email inbox on the go so you don't have to stress over only being able to organize your messages from a computer.